My husband and I love to go camping. Whether it is tent camping in the nation's capitol, taking the popup camper to Pigeon Forge, or renting a cabin in Cherokee, camping is our choice of vacation methods. The great thing about camping is that you have the time to just sit around a warm campfire and enjoy the beauty of nature around you. Another thing we love about camping is campfire cooking. My husband has been cooking on campfires for years and I have found a great appreciation for the art as well. I say "art" because you really do have to understand the coal ratios and heat distributions in order to successfully cook and not burn your food. As we prepare for our first camping trip of the summer, "Dutch Oven Fever" has begun to take hold. Tonight, we decided to experiment with a new recipe. With a large number of ripe bananas on hand and a cake mix in the cabinet, it was time to create a Bananas Foster Cake. The result was surprisingly moist and perfectly sweet. You can make this in your oven, but I would still recommend a cast iron skillet for baking. So at your next cookout or camping trip, impress your friends and family with this delicious dessert! 1. Heat charcoal until ashy. 2. Place 7 briquettes on the bottom of the cooking surface. Place the Dutch Oven on top of the briquettes. 3. Add butter to the pan until melted, making sure to also coat the sides of the pot. 4. Stir in brown sugar and rum. Continue to stir until dissolved. 5. Place the sliced bananas into the sugar mixture. Allow to sit for 3 minutes. 6. While the bananas are warming, combine the remaining ingredients in a large mixing bowl. Whisk until just combined. 7. Pour the cake batter over the banana and sugar mixture. Carefully stir the banana sugar mixture into the batter. You do not want to completely combine the layers, just gently swirl. 8. Place the lid on top of the oven. Place 18 coals on top of the lid. This ratio will create an approximate 350 degree cooking temperature for a 10 inch dutch oven. 9. Cook for 40 minutes. The cake should be deeply golden on top. 10. Carefully remove the lid without dumping ash into the cake. 11. Allow to cool for 5 minutes. 12. Carefully flip the cake onto a large plate. Note: If you are baking in the oven, complete steps 2-6 on the stove top in a large cast iron skillet and then bake at 350 degrees until cooked throughout. Summertime means a return to the grill and enjoying the company of family and friends around a picnic table. A staple at cookouts is grilled chicken. Tonight I wanted to experiment a little and combine some of our favorite flavors to create a finger-licking-good grilled chicken. There is absolutely nothing bland about this chicken recipe. All of the pieces are tender and juicy while still crisp on the exterior. By marinading for 2 hours in the dry rub, the flavor reaches all the way to the bone. I am definitely keeping this recipe close at hand. While we were enjoying this wonderful meal, I actually said "This is the best barbecued chicken I have ever eaten!" For a Southern girl, that is a BIG statement! 1. Cut the chicken breasts in half across the middle to make the pieces all similar in size. Place the chicken in a large bowl. 2. In a small bowl, combine all of the dry rub ingredients. Sprinkle over the chicken, tossing the meat around and thoroughly coating all pieces. 3. Cover with plastic wrap and place in the refrigerator for 2 hours. 4. Remove from the refrigerator and allow to sit at room temperature for 10 minutes before cooking. 5. 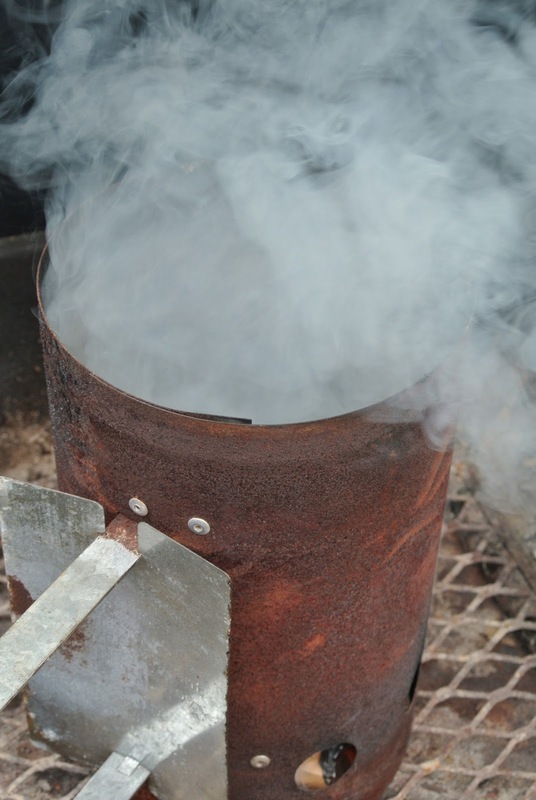 Preheat the grill over LOW heat. Place the chicken skin-side-down. Close the lid and allow to cook for 20 minutes. Flip and cook and additional 20 minutes with the lid down. While the chicken cooks, prepare the sauce. 6. In a small saucepan, sautee the onion and garlic in vegetable oil. Season with salt and pepper. Cook for 3 minutes or until starting to become tender. Add the remaining ingredients. Stir. Simmer on LOW for 10 minutes. Remove from heat. 7. When the chicken is cooked, brush each side with the sauce and allow to cook for an additional 10 minutes on LOW heat. One night last week, I decided to make up a quick garlic lime marinade for some chicken that needed to be cooked. I quickly threw together various items from the cabinet and the result was delicious! Since that time, this is actually the second time I have made the wraps because they are SO GOOD! Feel free to customize the toppings to your taste. I like my wrap with avocado, tomato and lettuce while my husband likes the chicken on a bun as a club sandwich. The real key to this recipe is the marinade. Even just plain chicken breasts grilled and served with summer vegetables are great with this quick and easy combination. 1. Combine marinade ingredients in a shallow dish. Place the chicken into the marinade. Cover and refrigerate for 30 minutes. 2. Preheat a grill pan over medium heat. Cook the chicken strips on medium heat for 5 minutes per side or until cooked throughout. Remove from heat and slice into large chunks. 3. To assemble the wraps, place a slice of cheese in the middle of the wrap. Lay the hot chicken directly on the cheese. Top with a strip of bacon and then selected toppings. Tuck the ends in and then fold over like a burrito to roll. Note: You can also eat the chicken on a bun with the same toppings if you do not have or do not like wraps. On this hurried Monday night, I find myself very thankful to have leftover pulled pork in the refrigerator. Although the meat and slaw is ready, I still need another side. I consider baked beans, corn on the cob, or even baked potatoes, but I am just not excited. Suddenly, the idea of a french fry comes to mind. While I do LOVE a good fry, I am not very interested in a deep fried potato, at least not tonight. So what to do? Suddenly I remember a particular french fry recipe my husband made one night. He was treating me to a wonderful steak dinner with fries; even better than the food (which was amazing) was the fact that he was making the meal for me! While he used frozen fries (which also work GREAT), this recipe starts from scratch, because I have plenty of potatoes in the bin. The fries come out crisp without being fried while the seasoning adds a nice flavor with a little kick of spice. This recipe will please husbands, wives, kids....even in-laws! 1. Using a sharp knife, carefully slice the potatoes into quarter-inch thick fries. Immediately place the sliced potatoes into a large bowl filled with 6 cups of cold water. Allow to sit for 20 minutes. Remove and towel dry. 2. Place the dried potatoes into a large zipper bag. Add the oil and seasonings to the bag. Seal and shake to thoroughly coat all the raw fries. 3. Spread the seasoned potatoes onto a large baking sheet in an even, single layer. 4. Place in a 375 degree oven. After 25 minutes, carefully flip the fries. Bake an additional 20-25 minutes until dark golden and crisp. Although I love to cook and am in the fifth year of my small bakery, many of you may not know that my actual day job is as a high school counselor. I am fortunate enough to be able to work with some amazing young people. I fill my days with one-on-one sessions discussing future plans, academic endeavors, college aspirations and social resolutions. The relationships I form with my students is not only beneficial for them, but it also inspires me to continue to aspire towards my dreams on a daily basis. With it being the end of the school year, it is that time when students start to give their teachers small tokens of appreciation. This past week, I was lucky enough to receive such a gift; I have to say, it is probably the best teacher gift I have EVER received. Was is flashy and expensive? No. Was is thoughtful and personal? Yes. So what was this amazing gift? A lovely young lady and her family gifted me a watering-can flowerpot filled with freshly picked strawberries. Although simplistic in material value, the thoughtfulness behind the gift got me to thinking, "What are my favorite gifts to give?" Without a doubt, I am a homemade, personalized gifter at the core. I am constantly on the search for new ideas of how to show affection beyond a store-bought item. Candy: Every Christmas, there is a huge request for my traditional homemade candies. I use the same fudge recipe my mother taught me as a little kid. The basic recipe creates a melt-in-your-mouth, rich chocolate that is AMAZING! However, I also mix it up with different variations. Throw in some nuts, peanut butter swirl, marshmallows, anything you like....possibilities are truly endless. 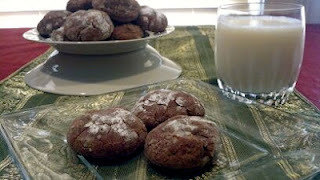 In addition to fudge, there is always room for coconut macaroons and peanut butter balls. 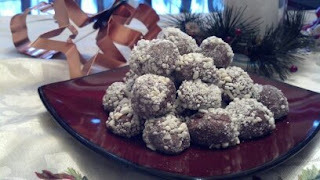 I even experimented even further this year and created some new truffle recipes. No matter what I make, a simple package of cellophane bags with ribbon or festive takeout boxes is the perfect finishing touch. Baked Goods: In addition to candies, another sweet treat I love to package up and give includes various baked goods. Sometimes it is as simple as mini-loaves of sweet breads and pies. Other times I love to use large tins and fill them to the brim with cookies including chocolate chip, peanut butter, white chocolate cranberry, candy bar, and chocolate chunk. Since cookie recipes typically form large batches, choosing 3 varieties and then doing a mix-and-match tin allows you to throw together several gifts in very little time. The great thing about giving cookies is that you can make one tray, place them in the break room with a nice note and then the gift for the entire department is complete! 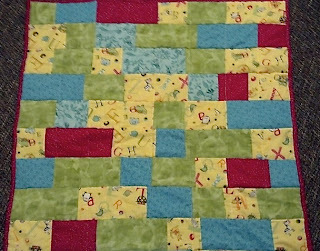 Quilts: This is something completely new for me. I have always wanted to make quilts, but was always too scared to try my hand at the craft. Recently, a very dear friend found out that she and her husband was expecting a brand new baby. I wanted to be able to give them something heartfelt that could be treasured by the family and baby. So what did I do? I decided to finally face my fears and make a quilt. Now that I have made one, I have found myself already starting on another one, no longer crippled by my fear of failure. By receiving the beautiful bucket of strawberries from my dear student, I was reminded of my love for giving from the heart. During this time of year when the harvest is plentiful, look around you and find the beauty in nature. Give a gift of fresh fruit, a basket of vegetables or even a bouquet of flowers. I assure you that the recipient will love it more than anything money can buy! Last night I was looking for something different for dinner. I happen to LOVE cauliflower, but my husband, not so much; he does, however, love andouille sausage! In order to please both pallets, I combined the two. Roasting the cauliflower gives it a nice sweet flavor that balances the slight spice of the sausage perfectly. Running short on time? This recipe cooks in only twenty minutes! I simply served it with an ear of boiled corn on the cob and dinner was served. 2. Using a sharp knife, carefully cut the cauliflower into bite-size flourettes. 3. Slice the andoille sausage on a bias into 1-inch lengths. 4. Place the sausage and cauliflower in mound on a baking pan. Drizzle with oil and seasonings. Use your hands to thoroughly coat. 5. Arrange the mixture in a single layer, but still close together, on the baking pan. 6. Place in the preheated oven for 20 minutes or until golden, turning after 10 minutes. I know we have all been there. You get home from a busy day at work and have 30 minutes to get something on the table for the entire family to eat. Meatloaf is definitely a family favorite, but how can you make it to the table with meatloaf in 30 minutes???? Well why not mix up the routine, break out a muffin tin, and make personal meatloaf muffins?!?! These mini-meatloaves are tender, tasty, and flavorful, and, best of all, on the table in 30 minutes! Kids love them because they are small and more fun than a typical loaf. 2. Combine all ingredients, minus ketchup, in a large mixing bowl. 3. Lightly spray the muffin tins with non-stick spray. 4. Using your hands, make small balls of meatloaf mix and place in the tins. The meat should come 3/4 the way to the top of the tin. 5. Bake, uncovered, for 20 minutes. 6. Cover each meatloaf muffin with ketchup and return to the oven for an additional 10 minutes. 7. Remove from the oven and carefully remove from the tins. With the weather getting warmer and the days getting longer, it is time to begin outdoor entertaining with family and friends. After a cookout on a hot summer day, a cool, refreshing dessert is the best way to finish the meal. I first made this recipe as a twist on the classic Cherry Yum Yum, a classic Southern dessert. This pie was such a hit that it is now expected at family gatherings. You can change up the pie filling for different berry flavors and have a large dessert spread in no time! 1. In a large mixing bowl, combine the pudding, whipped topping and condensed milk. Using a mixer, whip the ingredients for 2 minutes. 2. In a separate bowl, combine 2/3 of the crumbs with the melted butter. Spread into the bottom of a 9-inch pie pan. Press down to form a crust. 3. Spread 2/3 of the whipped filling into the crust. Carefully spread into an even layer. 4. Pour the pie filling over the whipped layer, making sure to cover the entire surface. 5. Spread the remaining whipped filling over the cherry layer. 6. Sprinkle the reserved dry graham cracker crumbs over the top of the pie. 7. Cover with plastic wrap and refrigerate for at least 4 hours before serving. To be perfectly honest, I do not really consider this a "recipe." Instead, this is a round two meal using leftover Sloppy Jane filling. However, it is so quick and easy, you might just make this a round one meal instead. This hearty yet light meal fills you up without making you feel as though you have eaten a 4 course meal. A one pot dish wonder for a complete meal. The additional toppings I listed are merely a suggestion and reflect what I like to eat with mine. However, if you like it a little spicier, you might consider adding some hot sauce or peppers to the mix to give it a little Tex-Mex flavor. Mix it up...be creative. This easy and inexpensive meal feeds 6. 1. Wrap the potatoes in aluminum foil and place in a 425-degree oven for 1 hour 15 minutes or until soft to the touch. 2. Slice each potato in half lengthwise. Use a knife to gently break the inside of the potato apart. 3. Spoon 1 Tablespoon of sour cream onto the warm potato. Top with Sloppy Jane Filling, cheese, and green onions. In honor of Cinco de Mayo, it was time to break out the black beans and make a little salsa. This is not the normal, tomato based salsa. Instead, it is filled with fresh corn, lime, cilantro, and onion. Roasting the corn, tomato, and onion adds an extra sweetness to the recipe. This light and refreshing salsa is great for the upcoming warm months. For an added bonus, it is great for getting ready for swimsuit season.....if you are into that kind of thing! ¡Olé! 1. Place the corn kernels in a pile on a baking sheet. Place the tomato halves, flesh side down on the pan. Lay the onion along side the other vegetables. Place under the broiler for 3-4 minutes or until just starting to brown and the tomato skin is pulling away. Remove from the oven and allow to cool slightly. 2. When cool enough to touch, carefully give the tomato and onion a rough chop. 3. Place all ingredients, except the lime, in a large bowl. Squeeze the juice of the lime over the vegetables. Stir. 4. You can either enjoy immediately or cover and allow to sit in the refrigerator until ready to serve. I am about to reveal the recipe for one of my most secret cakes. This cakes is requested all the time the birthday parties and special occasions. Sometimes I make it as a layer cake with a rich chocolate buttercream, other times I serve it piping hot with a scoop of ice cream. Today, I have a birthday party for my younger cousin so it was time to decorate for a 9 year old. Love this cake! 1. In a large mixing bowl, sift together the flour, sugar, salt, cocoa powder, baking soda and baking powder. 2. In a large measuring cup, combine buttermilk, oil, vanilla and eggs. 3. With the mixer on low, slowly add the buttermilk mixture to the flour. 4. Slowly stream the hot coffee into the mixer. Scrape down the sides and bottom. 5. Carefully stir the pudding mix and chocolate chips into the batter. 6. Pour the batter into a baking pan that has been lined with parchment paper and then greased and floured. 7. Bake at 325 degrees for 50 minutes or until completely set in the middle. 8. Remove from the oven and cool in the pan for 10 minutes. 9. Carefully turn the cake out onto a cooling rack and allow to sit until completely cooled. 10. Cover with a chocolate glaze, buttercream icing, or just a scoop of ice cream. Enjoy! Ok. We have all heard of the Sloppy Joe, but did you know he had a sister, Sloppy Jane? These sandwiches are a combination of vegetables, beef, and spices for a messy but flavorful dinner. I love to use the leftovers for my Sloppy Jane Potato Boats. However, you could also make a wonderful nacho appetizer for a party! 1. In a large skillet, combine the ground chuck, onions and garlic over medium heat. Use your spoon to break the meat into small pieces as it cooks. Continue to cook until the meat is browned. 2. Add the dry spices to the pan. Stir. Allow to toast for 1 minute. 3. Add the remaining ingredients. Stir to combine. 4. Cover the pan with a lid and cook for 30 minutes over medium-low heat. You want the pan to be at a steady simmer, not a hard boil. Stir occasionally. 5. After 30 minutes, remove the lid. If the sauce is not thick enough for you, allow to simmer uncovered for 5-10 minutes. 6. Serve on a toasted sandwich roll.